Neal Schroeter MD, lives in Ironwood, MI and is an Emergency Room physician in Ashland, WI. 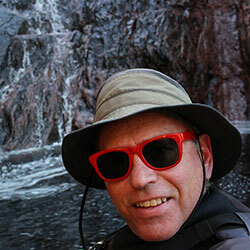 He is an ACA level 4 Whitewater instructor, a level 5 Coastal Kayak instructor & level 4 Instructor Trainer. He is the owner of Whitecap Kayak, a business that mentors youth in leadership skills through kayak guiding & instructions. He is also a pastor at the Range Community Bible Church in Hurley, WI. So, you say you'll stay dry?!! Famous last words! Cold water goes with paddling in the midwest. Cold water immersion and hypothermia is one of the biggest dangers paddlers face. To stay safe, it's necessary to have a healthy respect for the cold waters we paddle. We will consider how to prevent, recognize, and potentially treat cold water injuries. This presentation could save your life!